What do two cowgirls do on a roundtrip tour on the Alberta highways to pick up bulls , load ’em up and head on home within 9 hours of traffic, torrential rains, glorious Alberta sunny skies? 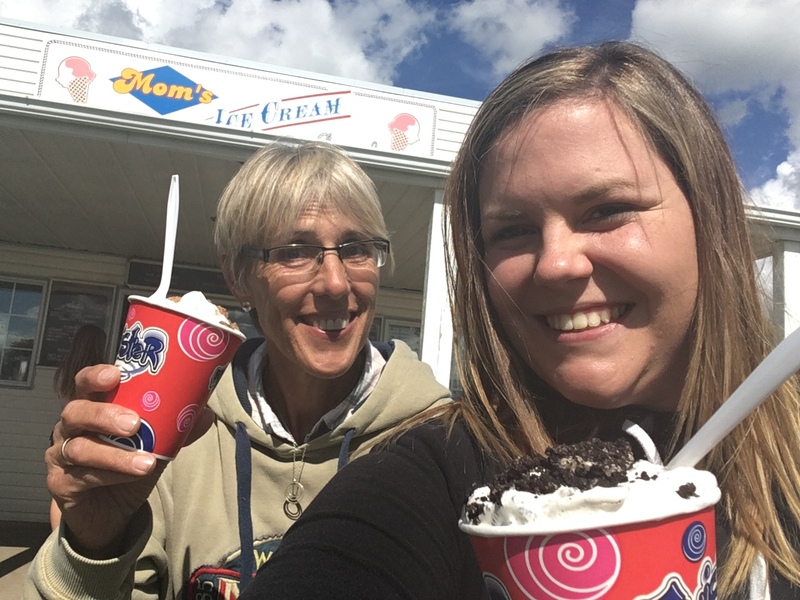 Why…..we turn off that big old highway..park the bulls….and find ourselves some ice cream!!!!! Today Flicka Rancher and her favourite, one and only, ever-so-helpful step-daughter Shelby had the privilege of picking up three of our bulls at one of our pastures….4 hours away and along with help from Carol (the Mrs owner of the pasture out there-her hubby out haying) we loaded up those three big boys, turned around and came home to finish off our 9.0 hour truckin’ shift. Got some more REAL practice backing up the trailer again, gets a wee bit “easier” every time. The REAL practice makes the learning so much more meaningful. Thinking I might just volunteer for that one again!!! I like the ice cream part!! !